Family dinners are fantastic ways to bond — you can all talk about your day, share stories, relax — but it’s also smart to make the meal preparation part of the experience. There’s something fun about having all hands on deck in the kitchen, even (or especially) when minor mishaps occur. Plus, you get the bonus of teaching your kids how to cook, so they learn a helpful life skill while you spend time with them. Your hometown has something worth seeing. It’s practically guaranteed. The problem is that almost nobody ever thinks to see these sights, since they’re considered “tourist” destinations. But a great way to get out and spend time with your family is to spend a day or a weekend being tourists in your own city. Historical sites, local attractions, specialty museums, even ballparks or shopping centers: There is something awesome in your city that you haven’t done. The added benefit here (besides bonding) is obvious: Everybody stays in shape. Working out as a family, from runs and hikes to strength training and sports, is a great way to stay healthy while offering wellness support to the people who matter most in your life. You can track performance, cheer each other on and rely on the family for support. Classic and reliable. You don’t have to be the outdoorsy type to pull this off, either. A few modest supplies and a family-friendly park make it easy to spend the night out in nature. The big draw, though, is that spending time at a campsite means everybody can put away the smartphones and tablets that drive their lives (this goes for the parents, too). Take hikes, sing some songs, cook over an open fire and forget about Twitter for a night. You’ll be amazed. This is another way to mix bonding with health and wellness. Starting a garden in your yard lets you grow fruits and vegetables for your meals and gives you a shared project that benefits everyone in the family. Talk to the staff at your local nursery to learn more about what plants work best in your region, then see what your kids would like to grow. Growing actual living things is a great way to learn about the environment and the pleasures of seeing your work rewarded. If you’ve got younger children — from below reading age into elementary school — family reading can be a great way to grow closer. For younger kids, it’s a time to learn how to read and spend time with stories they’ll remember for years, while for older kids, it can be a good opportunity to introduce them to books you loved when you were a kid. Public libraries are a great way to expand this, too. They often have storytime for younger kids, and you can also talk to the librarian to find out great titles for different age levels. Almost every family winds up with a legendary (or maybe just infamous) story about a family game night. Maybe it’s the round of Monopoly that wouldn’t end, or the time somebody tried to play a word in Scrabble that was clearly fake. Families have these stories because, believe it or not, simple things like game nights are wonderful ways to build strong bonds. Games teach sportsmanship, rules and the importance of give and take, and like family dinners, they unite people around a table and encourage talking, laughing and participation. 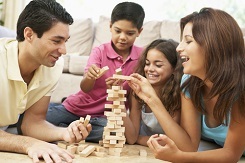 Planning a regular family game night — Friday nights, Sunday afternoons, whatever — ensures that, no matter what else is going on, your family has a time and place to come together. It’s that consistency and commitment that forms the basis of real bonds.